I knew swimming would be a challenge because when I began this journey I didn't know how to swim....at all. But what I didn't expect was how that first open water swim would go. The racing heart rate, the slower pace, the complete panic when you put your face in and can't see a thing was all unexpected. But then I did my first triathlon and learned what the panic was all about. Throw in the people kicking and thrashing about and it all becomes about survival! I started to dread the swim. But then I did my first 70.3. And because I was injured I held back and started long after everyone had taken off. And I had the best swim ever! It was actually beautiful. I had no anxiety whatsoever and I loved every second of it. So I learned to take the pressure off of myself. Now I am sure there will be more races when panic ensues or something goes wrong. But I have full confidence I can do it! At 8 weeks post op I was released from the doctor and allowed to resume activities. I got in a pool swim or two and then I saw my team was meeting for an open water swim. I wanted to see them so I thought what the heck I can use the practice! And we got in a mile swim and it felt great! I can almost compare a pool swim vs open water swim to a track run vs trail run. The open water swim is a nice change of scenery and it doesn't have the redundancy of lap after lap. I think my favorite part is that you just swim and don't have to think. It's me and the water and I am beginning to love it!! 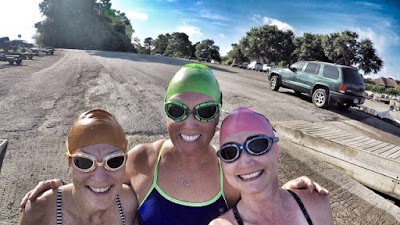 It helped that I got out there with these great girls - my coach Gena and Kim! They have been there since the beginning of my triathlon journey!! I cant't wait to go out again!! Such a great swim, Jill! So glad you're enjoying open water!!! Enjoyed reading the piece. We tend to forget New Year resolutions,But this year i had decided i really need a change,i must stop being a edubirdie victim and had so chosen “Abundance”.